The Fair aims to cater for everyone, young and old alike. Amongst those pleasure rides presented this year will be the old favourites such as Waltzers, Dodgems, Galloping Horses, together with the more spectacular rides such as the Freak Out, Kiddies' Corner and the Extreme Ride and perhaps one or two surprise attractions. 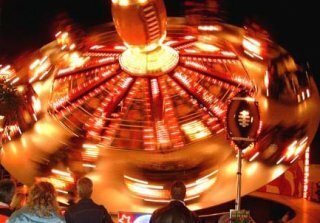 This year's Loughborough Fair will take place between Wednesday November 13 to Saturday November 16, 2019. Fairs have been held in Loughborough for centuries, the first official Charter being granted to the Lord of the Manor, Hugh le Despencer, in 1221 by King Henry III. The Fair was then held on St. Peter’s Day and, assuming it has been held annually, will have been coming to the town for 797 years. Approximately 100 individual show people attend each year, presenting between them some 20 large rides, numerous children's roundabouts, game and novelty stalls, and the usual popular refreshment stands. Please see map below showing road closures and diversion routes during the fair. For details of the car parks in Loughborough, visit our parking webpage.